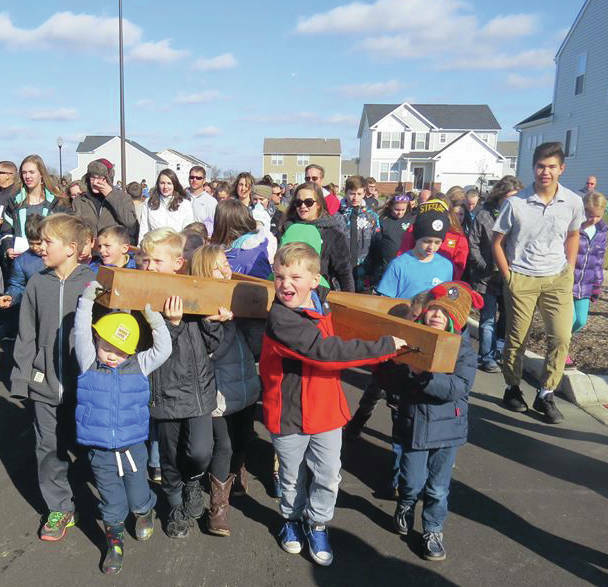 On Nov. 26, members of Sunbury Christian Church carried a cross 1.8 miles from its old location on Rainbow Avenue to its new location on Admiral Drive. The “generational journey” had children carrying the cross the final steps of the way. Passersby can see the cross in the window of the new Sunbury Christian Church, now located at 870 Admiral Drive, from State Route 3. Open House: Dec. 6, 6 to 8 p.m.
Grand Opening: Dec. 10, 9 to 10:30 a.m.
Sunday Services: 9 a.m. and 10:30 a.m.
Christmas Eve Services: 5 and 7 p.m.
Info: http://sunburychristian.com/ or call 740-965-3821. 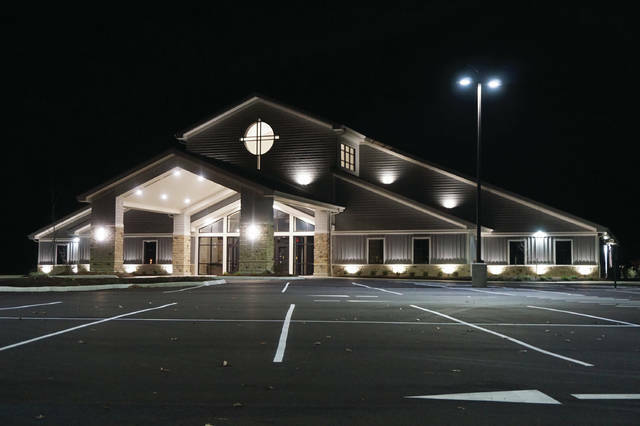 The Sunbury Christian Church has moved across the village — from 250 Rainbow Avenue to 870 Admiral Drive. There will be an open house on Wednesday and a Grand Opening service on Sunday to mark the move. 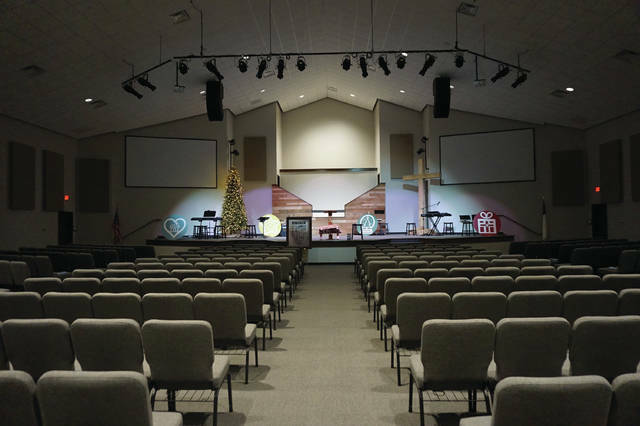 Minister Mike Bratten said the new church had an attendance of 680 for its soft opening on Dec. 3, compared to a cramped 563 worshipers at the old location on Nov. 26. The independent, non-denominational New Testament church dates back to 1956, and at one time met in the Town Hall. It has had three builds to add on at Rainbow Avenue, the last coming in 1995. However, the two-acre site was limiting the growing congregation (from under 200 to more than 500), and the church wanted to be more visible in the community. Bratten said the church bought the property on what is now Admiral Drive in 2008, and waited for the Communities at Sunbury subdivision to be built around the new site. In addition to the large sanctuary with expandable walls, there are rooms for all ages of children, a kitchen, lots of parking and a lit-up cross in the window that offers a stunning view at night if you are driving south on State Route 3. Pastor Mike, in his 19th year at Sunbury Christian, was so proud of the new church that he didn’t want to be photographed for the story, insisting it wasn’t about him. Inspired by the Ark of the Covenant, church members took a 1.8-mile walk from the old location to the new after the Nov. 26 service. The walk included taking a cross made from reclaimed wood on the old property. At each transfer point, prayers and scripture readings took place. Church elders started, taking the hollowed-out cross made by co-founder Dan Heil from the old site to the Harrison Street Elementary playground. The cross then passed on from the oldest to the youngest members during each successive stage, from the Town Hall to the Old Train Station crossing the overpass to the Communities at Sunbury. Children then carried the cross the final steps into the new drive way.